This dip is simple because few ingredients are used... but it is also delicious because the taste of the sea is mixed with the smoky and spicy flavor of the chipotle pepper . And also cream cheese is used that provides a soft and creamy touch to the dip. It is a fantastic combination of flavors and textures. This is one of those recipes that you must have handy because it is easy, quick, tasty, inexpensive... It really has it all to take you out of trouble on more than one occasion. The tuna and chipotle dip can be accompanied with any snack or it can be used to stuff avocados, tomatoes, zucchinis, chayotes, etc. This is a recipe for beginners, anyone can make it. The chipotle peppers that are used in this recipe must be in adobo or if you want to cook a lot you can prepare them yourself. For this dip 1 can of tuna is needed, which can be in water or in oil. The dip is prepared with cream cheese, which has to be natural and without any flavoring. In less than 5 minutes the dip will be ready. 1 cup of dip will be obtained. Remove from 1 can of tuna the water or oil and put the tuna in a blender. 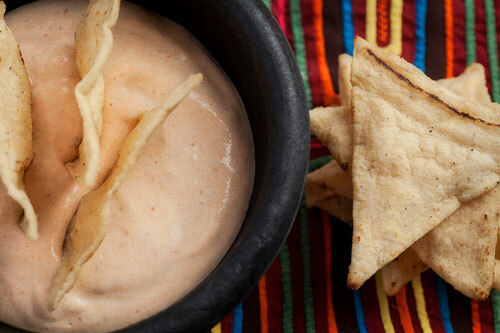 Variation: Now taste this dip with avocado instead of chipotle. Did you like the Tuna Chili Dip? To make your dip use these chipotle peppers in adobo because they have the best seasoning. Blend the ingredients to perfection with the “Ninja Blender" – it is a guarantee in the cuisine. With this bowl your dip will last fresh for a longer time.